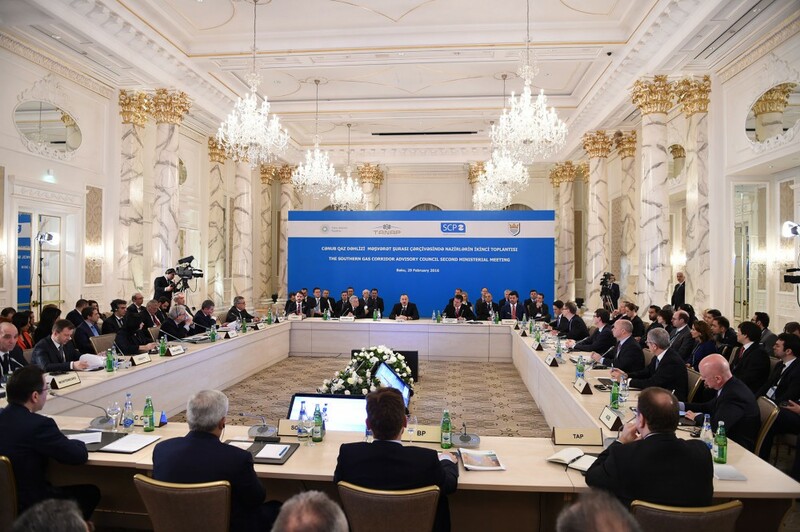 The second Southern Gas Corridor Advisory Council Meeting kicked off in Baku on Feb. 29. Azerbaijani President Ilham Aliyev has attended the meeting. He emphasized the significance of holding this event and added that it will focus on the work done in previous years and future tasks. The president noted that high-level and successful coordination work was carried out between the project’s participants following the last year’s meeting. President Aliyev recalled that the groundbreaking ceremony for TANAP project was held in 2015 and added that this project plays an important role in the implementation of the Southern Gas Corridor. He noted that the implementation of the Southern Gas Corridor project will make it possible to even more expand the beneficial cooperation between Azerbaijan, Georgia, Turkey and other countries. Today, energy security holds an important place in world politics and on the agenda of international organizations, according to Azerbaijan’s president. He noted that Azerbaijan remains committed to all its obligations and even more develops the principles of market economy. Ilham Aliyev said that energy cooperation can’t be a political requirement and this issue should be free of any political format. The president added that energy security plays an important role in relations with the European Union.